And interesting fact: Todd once ran for Pennsylvania state representative. If you ask most marketing and salespeople to tell you about the biggest change that has occurred their world in the last ten years, they’ll probably tell you that it’s the shifting balance of power between buyers and sellers. It’s true that the vendor-client relationship has changed, and it has permanently altered how we do business. But the real story is much bigger than that and goes way beyond just marketing and sales. This book is about the principles, ideas, and tactics people are successfully adopting that transform organizations into strong, enduring customer-centric businesses that are adept at building relationships that create competitive advantage. An inbound-focused business creates an amazing culture that treats employees and customers like human beings. 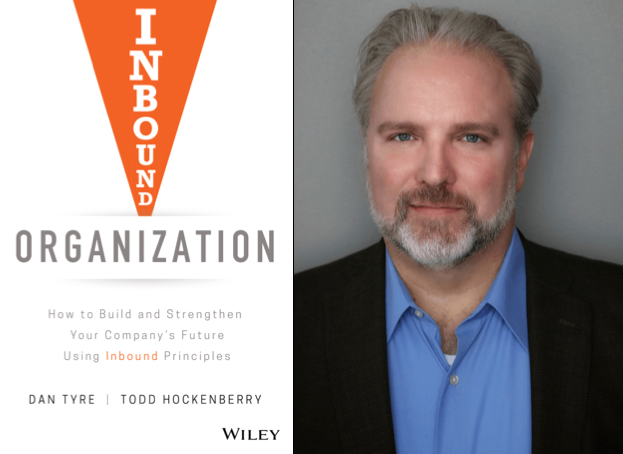 The book reveals the beliefs, principles, and strategies of these successful inbound organizations so that you can transform your organization into one too. Inbound Organization is intended to help leaders apply inbound practices across an organization and instill a new, holistic way of thinking about the entire business. This book is not just about marketing or sales, but how all departments fit together to deliver what buyers want today while creating a culture that fosters sustained success. The book provides insights into building an organization that creates relationships with buyers, employees, partners–with anyone in your business’s ecosystem–to establish a competitive advantage and increase brand recognition, conversion rates and market share–regardless of your industry. Inbound Organization is not about how to market and sell your product or service, but rather is about building an organization that has the people, culture, and strategies in place to succeed in the age of buyer control. An organization that wakes up every day focusing on making sure all of the people it touches are successful.